Home automation technology is on the rise, bringing opportunities for landscape companies. As you pull into the drive after a long day’s work, the exterior lights on your home perk up. You walk in the front door to a perfect temperature compared to the brisk outdoors. The door automatically locks behind you, the security system arms and you hear the irrigation system humming as sunset turns to twilight. Your evening playlist filters through the surround sound as you enter the living room and slouch into your chair to wind down. Fast-forward five years, and this scenario will be more common in households across the U.S., according to research from MarketsandMarkets. By 2020 the smart home market is expected to reach nearly $60 billion, up from around $20 million in 2015. How are landscape contractors and manufacturers translating this trend to the green industry? Some see new business opportunities, and they’re gearing up for them. Others see the potential to change the way their services are delivered. The bottom line: Now is the time to prepare for smart home technologies to proliferate and to migrate outside the home into your customers’ landscapes. Smart home technologies have evolved from independent, automated devices for household tasks—things like preprogrammed thermostats, lights and irrigation systems—to technologies that integrate these devices into one platform, predominantly an app. One example is Wink, an app that acts as the remote control for about 25 smart home devices. It’s the brainchild of General Electric and Quirky, an invention company powered by ideas submitted from the public. The technology is adaptable and can be valuable for everyone, McGovren says. He views it as “a big opportunity” for contractors. Some landscape professionals do, too. Take Jason Brooks, owner of Picture Perfect Landscapes in Memphis, Tenn. Still, the smart home market has a tough task ahead in terms of marketing itself. Around two-thirds of U.S. consumers with broadband households aren’t familiar with smart home technologies and where to purchase them, according to a study conducted by the Consumer Electronics Association and Parks Associates. But the market is on the right path, McGovren says. “These products are much more affordable than they ever have been,” he says. Another thing driving the trend is almost everyone has a “common platform” in a smart phone or tablet with wireless or cloud capabilities to operate a smart home system. Before, companies had to create their own interfaces. In fact, 64 percent of American adults are smart phone owners and rely on their devices as an entry to the web, according to the Pew Research Center. Given some segments of the landscape industry already have dabbled in remote-controlled technology, McGovren says there’s plenty of room for landscaping-related technologies in the smart home industry. At Wink, some already are on board. 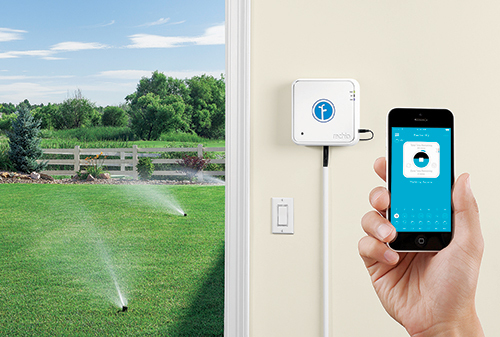 Take the irrigation controller manufacturer Rachio. Its flagship product, the Iro, is a Wi-Fi-based smart controller. It comes in eight- and 16-zone models and bears an Environmental Protection Agency WaterSense program label. It also integrates with home automation systems beyond Wink. “It’s important that we play nicely with these platforms,” says Ric Miles, business development and strategy, at Rachio. For instance, by “cross-sharing intelligence” with Nest, the Iro can detect a fire and the irrigation system will cycle. Other manufacturers, such as Weathermatic, McCrometer, HydroPoint Data Systems, ETwater and IrriGreen, have released mobile-based technology, although they’re all not designed to sync directly with smart home platforms. Some industry members say it’s the landscape lighting segment that has the most potential to lead the industry into the home automation arena. “That’s where a linkage to the smart home is absolutely dead-on,” Jamieson says. Ryan Williams, product manager for landscape lighting at FX Luminaire says the company is not blind to this. “Do we talk about smart home systems? Well, of course. It’s the new big thing,” he says. The manufacturer doesn’t have a product that connects directly into smart home systems at this time, but its Luxor comes close. Via an app, users can control the Luxor’s zoning, dimming and color from a palette of 30,000 hues. controlled capabilities, though they’re not necessarily linked to smart home platforms. In terms of who’s most interested in this technology, Williams says FX Luminaire sees most interest from high-end residential and small-scale commercial customers. Brooks, the landscape contractor, installs the Luxor. He sees the same customer profile, namely white collar folks with a “sensible” income, as his clients may pay a 15 percent to 20 percent premium for remote-monitored systems over basic LED systems. Men more than women look to “geek out” their homes, McGovren adds. And the most active population of smart home customers are between the ages of 35 to 45, he says. To cater to that client segment, Brooks reads industry websites and magazines and works his vendor relationships to stay on top of the product pipeline. Such tactics led him to Infrared USA, a manufacturer of automated pergolas—wired with remote-controlled heaters, lighting and fire pits. Brooks began offering these units this spring, quoting them at anywhere from $15,000 to six figures. It’s that open-mindedness—“no longer being isolated to your respected trade”—that will prepare the industry for the effects of the growing smart home market, McGovren says. Aquascape is researching smart home and remote-monitoring opportunities in the pond segment. Rhodes says the Aquascape products closest to the smart home market are its remote-controlled pump and underwater camera. But it has tested out several off-the-shelf smart home systems to evaluate if those Aquascape products, among others, could integrate with them. The “long-term goal,” Rhodes says, is to have a contractor’s team “dialing in” remotely on a regular basis to ensure customers’ water gardens are in proper shape. The contractor could do a remote diagnosis of a pond’s water temperature and chemicals upon receiving a service call. This way, technicians can arrive to the job site equipped with all they need to solve the problem. Or a best-case scenario would be to not have to go to the job site and instead make the fix from afar by adjusting chemical inputs, for example. The idea for this technology came about two to three years ago, Rhodes says. “It’s just a question of creating the system,” he says. The hope is to launch something in the next year or so. Bartlett Tree also has danced around the automation market with remote-control technologies, primarily with its digitally driven tree inventory system called ArborScope, Jamieson says. It first used this technology eight years ago for clients with large estates and corporate or educational campuses, such as the Masonic Temple in Washington D.C., and the University of Chicago. ArborScope creates a digital map of the exact location of trees on a property, also providing photos of the trees and measurements such as height and canopy width. 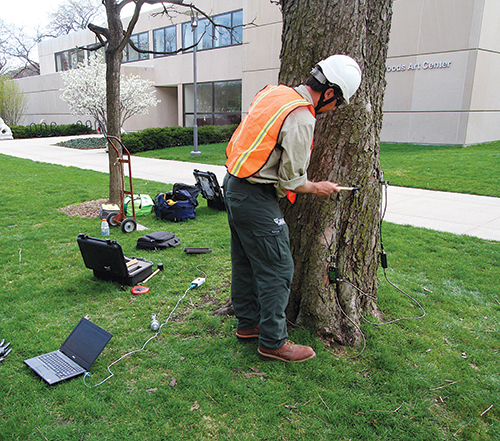 Arborists use devices like a GPS unit and laser range finder to measure locations and tree heights, respectively. The system also communicates with i-Tree, an urban forestry analytical software program from the U.S. Department of Agriculture Forest Service, to present ecological evaluations of a property, such as the amount of stormwater trees absorb, their cooling benefits and more. Again, the notion is this information can help technicians make a diagnosis from afar, better preparing them to go on a service call. For further remote-monitoring, Bartlett uses drones to evaluate tree canopies. It first did so three years ago in London for the royal family when crews couldn’t confirm if the top branches of diseased London Plane trees were safe to climb. While these examples, along with the irrigation and lighting segments, are paving the way for the landscape industry to enter the smart home market, the maintenance and lawn care segments seem to be trailing behind—in the U.S., at least. For instance, robotic mowers are more predominant in Europe—with John Deere and Honda releasing their Tango E5 and Miimo, respectively— but they’ve yet to pick up steam in the U.S. Meanwhile, forward-thinking contractors are left postulating what the future holds for such innovations in the landscape industry.